I recently found these scans of Barry Smith's Tupenny Conan Portfolio from 1974 on Heritage Comics auctions. What a great discovery--I always wanted to own this item as a kid but couldn't afford it! The cover to the portfolio is striking because of the intricate line work on the background with the leaves and vegetation. 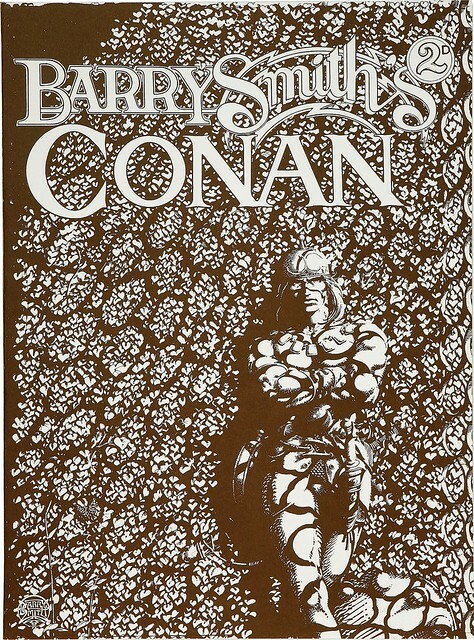 Conan ought to be completely hidden, but he pops out subtly, due to Smith's mastery with light and shadows. Looking at this I wanted to be a master craftsman like him with a pen. I had a different type of career instead, but just looking at the image again I feel the same way. 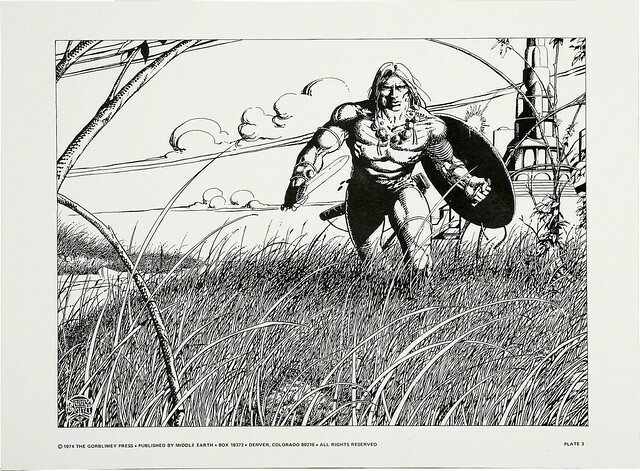 Conan hunting through a flatland covered with vines and grassland. This is a great artist who can make you feel something looking at the main character through blades of grass that he painstakingly drew. This reminds me of an illustration used for an advertisement in Savage Tales #2, which I wrote about on Giant-Size Marvel. You may recognize this illustration, as it was used for the cover and back cover to Marvel Treasury Edition #4 in 1975. You can only really see the fine detail in the original black and white version. 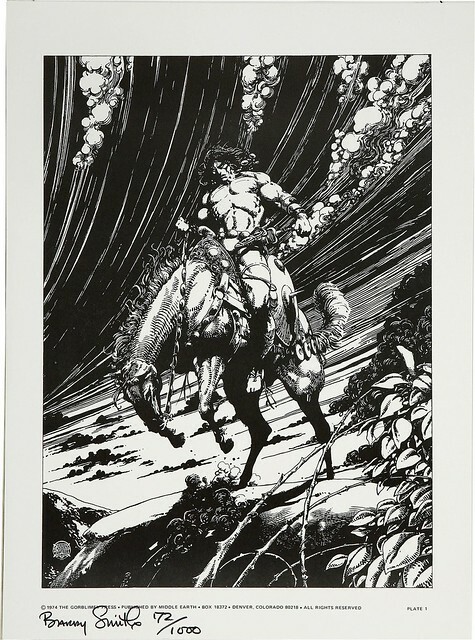 This plate featured Conan on a horse against the backdrop of a sweeping vista. There is a storm brewing in the clouds, in the horse, and Conan is the guy who can master all of it. 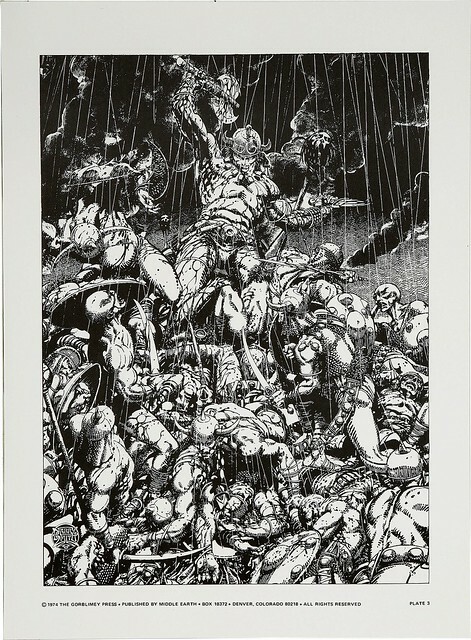 If you want to see another cool Conan illustration, check out my article on King-Size Conan #1. I originally thought that I had a pretty good scoop here with these scans. Now I see Cap'n's Comics posted even more scans last year on his site, do check those out when you get a chance! Nuff Said. Just found your blog. Thanks for posting such terrific artwork. I love the masthead.